There's a bunch of stuff going on over at MSDN. They're making some cool changes and aren't afraid to break a few eggs to make an omelet. I used to think that MSDN was this static, non-moving thing, but I've been meeting with a bunch of folks on the various sub-teams and I'm seeing a resurgence of agility. (MSDN, agile?! Madness! No, seriously.) Soma blogged recently about some of the changes. Here's some of the stuff that's been going on lately at MSDN, as well as a Request for Comments (RFC) from me. I blogged while back about alternate views for MSDN, including a Low-Bandwith (loband) view. 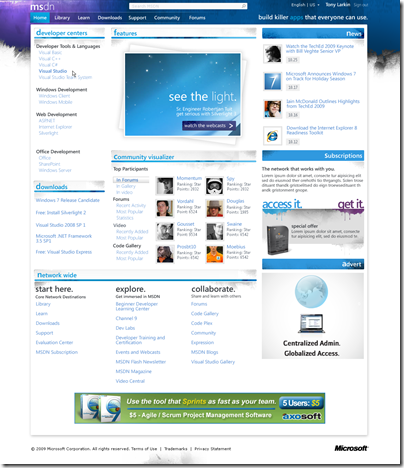 MSDN includes the Home Page (of course), the MSDN Library, Downloads, Community and Forums. The library experience (LEX) team has updated the loband view as well as the new dev10ide view. They're aiming for sub-1-second load times, small page weight and they are reading all the feedback. 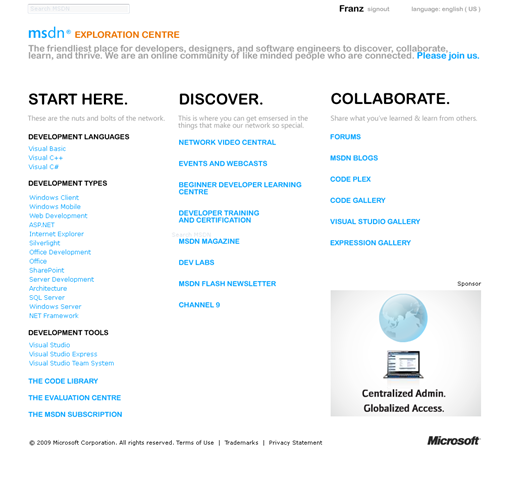 The MSDN Forums have been updated and are now written in ASP.NET MVC. This, along with other changes has made the forums markup much smaller and the site much snappier. This forum upgrade went out to all MSDN/TechNet forums, including the Windows 7 Forums and Windows Client Development Forums. 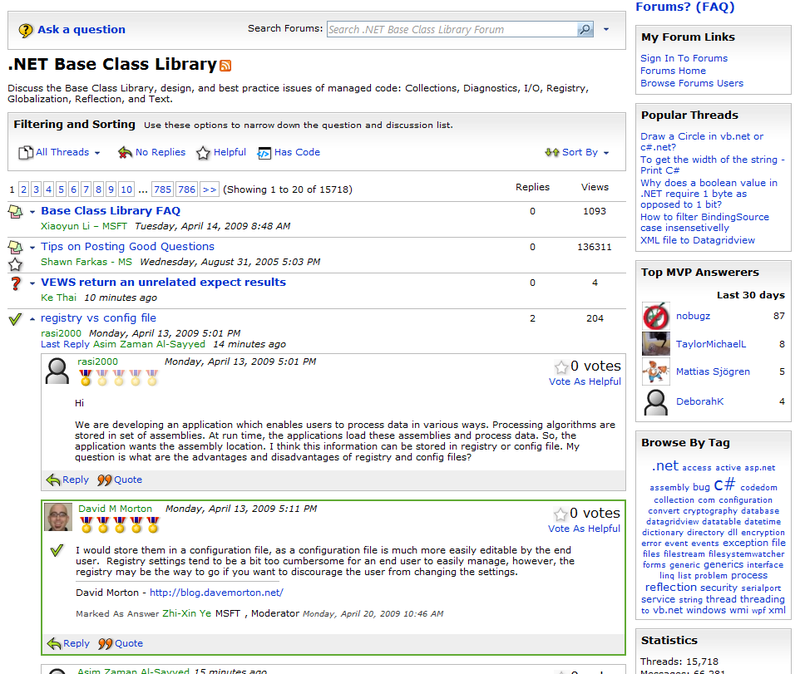 The Forums are also more answer-focused now, kind of like StackOverflow. You can see how many questions remain unanswered, mark questions answered, and browse by tag. There's also filters like "hascode" to show only Q&A with code, or you can show only "helpful" answers, or just proposed, but not accepted answers. 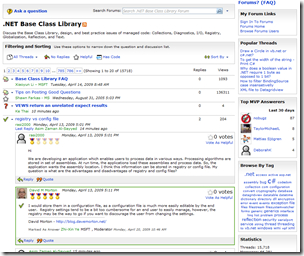 The Forum Reading view has been updated with AJAXy goodness, so you can expand threads without leaving the page. Other tweaks to MSDN include, the MSDN Community Center that includes not just blogs, but also tweets, delicious links, Technorati results and Diggs. What would a new MSDN look like? "If you're not getting in trouble at least twice a year, you're not doing your job." This statement really changed the way I thought about my job. It's good to push the envelope. I was in an MSDN redesign meeting and they were brainstorming on some potential designs. I said, hey, let's go crazy here and try some way-out-there-MSDN designs. A bunch of emails have been thrown around and since they never explicitly said "don't blog this," I figured, why not ask you guys, then take the feedback/comments you give directly to them. This is just brainstorming, to be sure, VERY early on for a potential redesign. I picked a few comps that the designer was working on that were in the same vein, but different in purpose. First, here's a concept design for a a would-be MSDN Home Page. There's two goals here, and a visual refresh is just one of them. The other is to change the user experience to make it easier to find things. To make it easy to find things you need, but also have enough active content to have "serendipity" moments when you see something you wouldn't ordinarily. There's a community visualizer at the middle there. It'd be an active widget and clicking on the left site would get you real-time results with recent activity, most popular items, etc from all over the network. 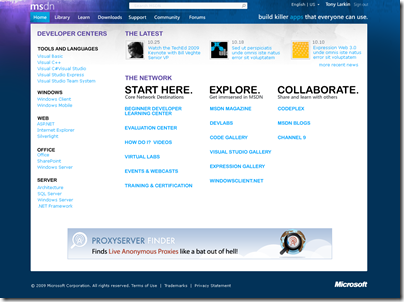 The Developer Centers are called out on the left-side to get you to the top areas in one-click. I pushed them to get you from the MSDN Home page to mostly anywhere in one click, two tops. For example, downloads has the most likely download links. At the bottom, you can get to other sites within the network. Darker? Notice the "channel bar" at the top in gray. This potential home page is as a result of me saying, do the opposite of what we'd ordinarily do. 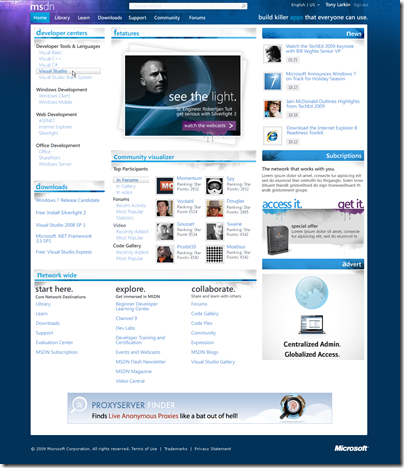 Is the MSDN Home page too visually busy? Make it simpler. How simple can it get, and if it gets simple, does it still provide value? Perhaps without the blue frame? Even simpler? Please offer your opinions and comments here. MSDN is your site and if you have an opinion, make it heard and I'll pass them out to my bosses. How should the site look? How do you want to use it? What do you think of these designs? What works and what doesn't? If me leaking designs like this is helpful, tell me here and I'll use them as character references at my Court Martial. All the better if you find it helpful, then I'll have good reason to share even more, even earlier in the process. Sweet. A new MSDN page... I like the ideas. Darker is my favorite, and the last two simpler ones. But would it lose value? Not sure depends how you categorize the and organize the subjects on the first page. My vote goes to the darker w/ gray channel bar (top). Definitely don't like the simple versions. I sort of dig the channel bar with the dark purple theme. I like darker choice with the channel bar at the top. I don't think the main MSDN pages need too much of an overhaul. They work rather well and get information across pretty clearly. The one thing I think really needs an overhaul is the MSDN library. Navigation in FireFox is still buggy, using the click-scroll. The filter by languages rarely saves, the side frame is completely annoying. I am torn between the one with the gray channel bar and the one below it (the simpler layout with the blue background). I really like the layout of content in the start here/explore/collaborate in the simpler example. Maybe a combination of the two by adding the channel bar to the simple w/ blue background. Aside from the design, I am very excited to see a change to the MSDN site design coming in the (hopefully) near future. I like the dark one with the channel bar, but I really have to agree with Jeff. The MSDN library needs some major love over the MSDN site itself. I just added one. It's a combination between light and dark. Thoughts? I also prefer the darker one with the Channel Bar. This Channel bar would make it very apparent and visual how to switch between various Microsoft properties. I also really like how you have the Community and Latest split out and has a filtering mechanism (or so it seems). Latest News is also in a good place. Overall, I really like that look. The others don't really do it for me and look more like advertisements. I also think the darker one with the Channel Bar looks the most polished and most professional. The image below the MSDN logo is a nice touch, but not too overbearing. Most of them feel too grungy and please, please, please don't go with bigger lower-cased letters in place of caps, it looks like a school kids homework. The colours are nice tho. As far as light vs dark backgrounds, I prefer the dark. It provides a nice contrast. The new hybrid one takes my eyes away from the content to look at the border between the light and dark. Too much going on there, IMO. I really like the overall design of the first one, but the channel bar in the third seems like a very useful addition! I have to admit I wouldn't bookmark the home page if it looked like the simpler version, but I do think that page is a much better introduction to MSDN for newcomers than the usual (busier) designs. P.S. : Not sold on that "combo" ... nothing wrong with it, but I actually like the dark borders. I like the one with the dark border and the channel bar. I do NOT like the simple designs at the bottom. And yes--keep leaking. It's people like you that keep Microsoft fresh. 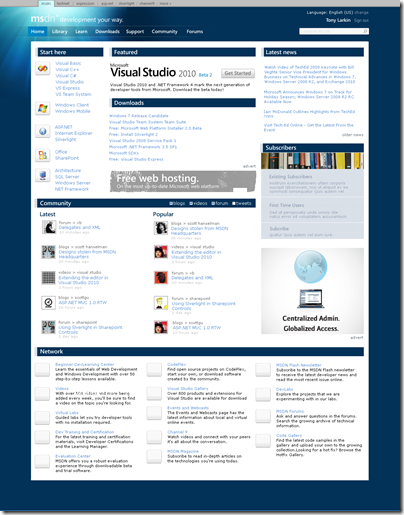 Casting a vote for the dark blue theme [MSDN_SHOE_HOME_D_2.png], or at least anything similar to it. MSDN is my home page and has been for a long time. Most of the time I'm searching for .Net or SQL related information and MSDN search is the the best place to find the answers I'm looking for. On the current home page I really like the blogs, downloads, and the subscription box. I would prefer the MSDN home page to accomediate more content, not less. 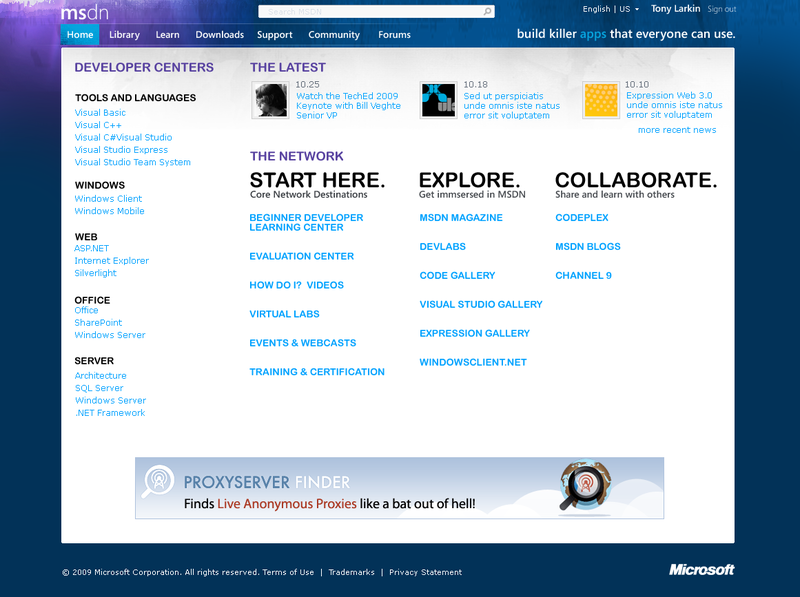 Actually what I've always wished for was a MSDN homepage that was customizable like MSN, yahoo, etc. I could add widgets for the Forums, blogs, twitter, downloads, etc. It would also be nice to somehow rank how relavent a technology is and what my prefered language is etc. So for instance I could say I'd like to see more or less silverlight stuff and even have the ability to filter it out all together. All I'm asking for is a MSDN homepage that can read my mind and do whatever I want, is that too much to ask? LoL. Anyways, my main point is please keep in mind that some of us rely on this site every day and what is important to me is finding answers and learning about better ways to do things. Thanks for all the hard work the MSDN team does! I know you won't let us down. 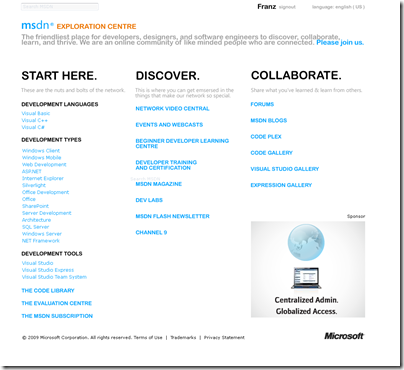 I like the new light-and-lean MSDN library pages. 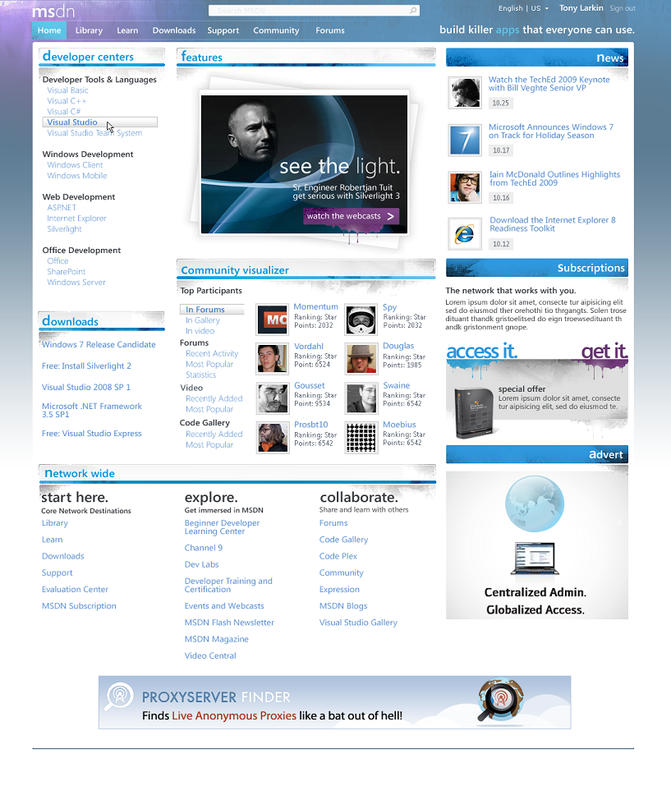 I like the last homepage design the most. I don't like dark themes, but that's a personal preference. The C# Developer Center's Community Tab should aggregate Stack Overflow's hottest questions with C# tags. I'd like the simple design the best if more prominence was given to the MSDN subscriptions link. People pay a LOT of money for that link (anywhere up to around 20,000 Australian dollars, which is roughly 16,000 US dollars, if you go for the full Team Suite MSDN license, from memory), and it's probably the only entry point to MSDN that people are forced to use. Most other content can be discovered by firing up your favourite search engine (which is usually quicker, anyway, as long as MSDN has a fairly high page rank for those terms). +1 for the dark theme with gray channel bar. Any chance someone could package up the MVC forums code as a starter kit or out on Codeplex? From what I can see, it looks waaayy better than anything else available on the .NET platform. Take some inspiration form Scott Gu's Visual Studio color theme (or yours ) get rid of the white background. Maybe use Consolas for the font. Aesthetics are important, but frankly these days everything needs to be done as fast as possible so the aesthetics are only good if they facilitate me getting things done more quickly. Loading time is important, sure, but when looking at each of these screens I was more interested in how quickly can I scan the page and find the content relevant to my needs than the aesthetics of how it was laid out and what colors were used on the page (although both of those obviously influence one other). My problem with every one of these layouts is that they require me to read a substantial amount of words on the page that don't pertain at all to what I am looking for or what I care about, and that's precious time that is wasted. I don't want to have to scan the page to find useful tidbits among many things I'm not interested in at all. I'd much prefer to give you some profile information about me (I'm already signed in with my Windows Live ID anyway) and let you do the heavy lifting, providing me with content that is the most relevant to me and what I do based on how well it matches my profile and not consuming screen real estate with stuff I don't care about. That's why I usually use google search, twitter, RSS feeds, and other Web 2.0 media today: they help me waste less time and get results faster. Why aren't we learning from those experiences and finding ways to boost productivity through websites as well? Writing this just reminded me to check...I don't even have a home page in IE that I use anymore because it's gotten to the point where I don't even have one page that I read in a browser on a regular basis because I don't have time to casually browse for what I need to find. Maybe you're not redesigning these pages for someone like me and you're more interested in the casual browser. But just in case you were, I thought I should tell you that while they look nice and while there may be one or two I find more visually appealing, none of them are going to suit my needs if they aren't smart enough to learn from me and only show me what is most relevant to my job. Learn from the usefulness of stack overflow. Tag content internally with appropriate tags so that they can be matched with users based on their profile (which should allow users to get as granular as they want to), allow users to mark items as relevant or not (or thumbs up or down) and influence the content on their own customized site as well as the customized site of other similar users within an allowed degree of variance from their own profile. Improvements like that will be much more likely to get my attention. One vote for MSDN_NORD_HOME. Why? Its simplicity. One of the biggest challenges we face with MSDN is accommidating folks who are visiting the site for the first time. Today, as a first-time user of MSDN, I'm confused. "What is this? Where do I go?" We need to simplify, simplify, simplify. Anyway, I vote for a skin-selector dropdown! personally, i don't visit the msdn home page that much. but I feel that the library pages could use some love. 2) when navigating, don't close nodes in the tree that I previously had open. 4) scrolling is broken on iPhone - the two-finger div scrolling is a pain. 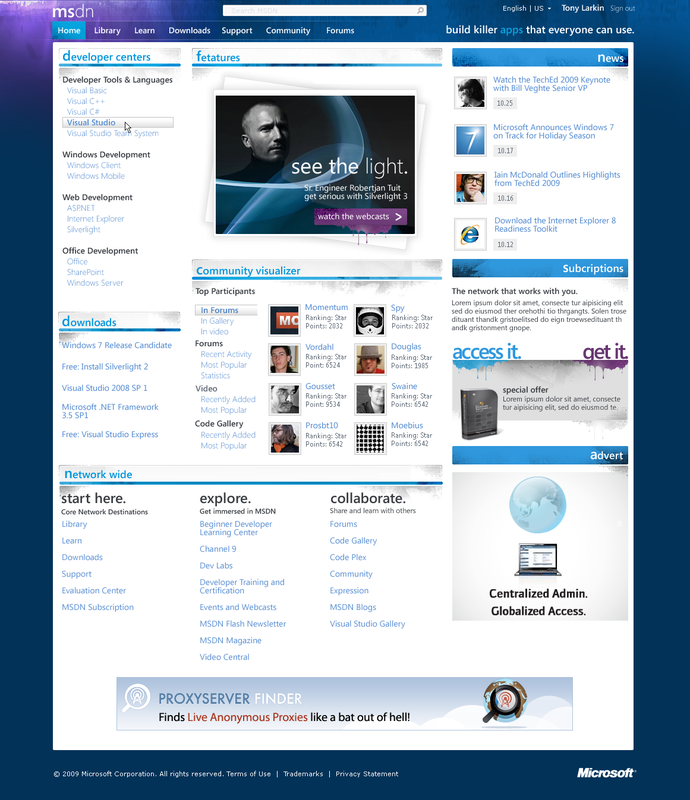 I love the simplified homepage, but I'd suggest keep the version with the blue frame. It adds some visual flair and makes a kind of emotional connection with me that I can't articulate. It somehow represents Microsoft's new and evolving personality, unlike the last design, which to me portrays Google's stark minimalism. Nothing against minimalism, but that is not what I think Microsoft wants to represent itself with, I think what the 'new Microsoft' wants to represent itself with is good, elegant design, yet having the guts to have a kind of visual flair that makes a connection. I love the rethinking of MSDN, by the way. Keep up with the good work, Scott. +1 for the simple layout. Nothing irritates me more than an awesome fancy design that's hard to use. the simple white one is my vote.! and can you make it as fast and elegant as bing? I didn't like the simple version, I prefer the dark purple theme. Scott, just curious really, but what exactly is your job at Microsoft? Personally, the minimalist designs appeal to me the most. They immediately direct me towards the content and let me drive my visit. I don't need to see more content at once, I have a search engine, stumble upon, and an RSS reader to give me content. Instead I'm looking for something quick, clean, and painless that helps me do my job quickly. The loband view made me very happy. I agree, get all the graphics out of the way and make the information central. The last one is my favorite. I'm more into the darker theme, with the blue light. Not sure about the gray channel bar, tho. I honestly don't understand how years and years go by and these sites still grind out new redesigns without really having any purpose. Serendipity moments? Easier to find things? How about a new color? A silly gimmick 'visualizer'? when are you people going to realize that people simply want help in using your tools to do their jobs better? we don't want purple, visualizers or news, we want help, stop wasting resources on stupid stuff like this. Two goals: a visual refresh (why bother on this?) and make things easier to find? I have two better stated goals: fix your search engine and make your centers online applications that let me decide what should go there. Why don't you blog something that says "hey, since we don't know and can't explain the 4 things we want our site to do for people, how about making it purple?" How about MSDN either publishing their page data as an XML feed and allowing folks to create their own look and feel, or allowing users to upload their own CSS definition (ala CSS Zen garden)? Then MSDN could have the "default" look and feel, along with options to select your own preference in look and feel, or the ability to essentially roll your own (though on your own server) fed from the data on their servers. Infinite possibilities while providing a dull, stale default look for people who aren't into visually appealing web pages. All the homepage redesigns in the world won't fix the rest of the site where we spend most of our time. I'm betting the rest of MSDN will remain as is, much like navigating away from the swank VStudio 2010 landing page gets you back to ugly as sin "rest-of-Microsoft" pages. When using MSDN search gives me zero results, but "site:msdn.microsoft.com" does, that means I'm never going to see this redesigned page since it's only a feel-good exercise for y'all, maybe some performance objective ticked off, and not actually the way people use the site. I like the even ones (starting from, naturally, 0). That is the darker variants. A design of a developer/SDK site site has to look like this, of course. I prefer the last one. I really don't want my dev resouce site to have a bunch of kruft on it. All that other stuff just gets in the way of the content. I like the simpler version with the blue bar. I go to MSDN for developer resources, and do not like to be hit in the face with clutter. I don't mind paying for an extra click for a quicker seek time! MSDN is a page for developers, It should think how to give a large amount of information to us with less space. Just like the lowband (orange/blue) version of MSDN, I like the last screen the most. Less is more! It's clean, easy on the eyes and it's keeps the focus on the main content (less distraction). Simple, Simple, Simple, Simple, Simple. And Dark. That first one looks like MSN - "ScottGu and BHarry caught pair programming! Exclusive pics inside!" "Is the new C# GC too trashy? Vote now!" "You won't believe what went down at Mix09" "Dear MSDN, this one time at Code Camp..." Do I need to go on? I want information, not silverlight effects. Simple, far and away. My current use of the MSDN home page is to type in a search and go as quickly as I can; all the junk packed in on the page annoys me to the point that I want to get away from it as quickly as possible. As far as aesthetics of the simple page, I prefer light-colored pages, but not plain white. Maybe even something similar to your blog, where it has a slightly darker variation on the border? I don't have a strong opinion on this, though. Get rid of the information overload. I would go for the one without the blue frame. It's easy readable, has good contrast. What about the "next" pages likes search results etc.. are they available? I prefer the MSDN_HM_NORD_5 mockup the best. All the other designs look too heavy. I second GlenH's request for the forums as a starter kit. I think there are a lot of us out here eagerly seeking good examples of applications written using MVC. One of the final two simpler ones, preferrably the light-colored one. Simple and light for me. I prefer the simple one. It's clean and easy. Thanks for your MSDN Updates and RFC info. I'm glad you even provided screen shots. This makes me understand more about your recently posted article. Shouldn't MS get in a semiotician, a web-marketer an a graphic artist to talk about our interaction archetypes, MSDN's brand personality, and to analyze the click-through statistics? It is a whole field of its own these days. Even an artistic dev with a great eye isn't enough anymore. As an exprience designer I would say that the last version is a slam dunk (although it could use a little refining). Simple doesn't mean less powerful, however simple is always the way to go if you can afford it. Like most, simpler is better, but give us content quickly. I'm not an android developer, but I have to agree with Uwe to a large degree just because it's laid out so well and without flashy adds telling me what's hip. I mean, I'm a (.net) developer, not a 15-yr-old social addict cruisin' the mall just to see what marketing genius is able to catch my eye. I'm not on MSDN just to "hang." If I see a big square telling me how cool Bing/Silverlight/Live mesh/TechEd/etc. is, I consider the redesign a failure and will continue my very light use of it. I'm *LOVING* the loband, however. Just LOVING it! A thousand thanks to those involved. Also, I like the direction that little helper is steering us toward: functionality over fashion. Good insight. That is the essence of the site's reason to live. I'll live just fine with whatever color scheme y'all choose. Scott, thanks for all you do, the objectivity and you strive for, and for (hopefully) keeping your marriage and family a priority above all this other fun stuff. Despite the utter personal-ness of that, it really does make a difference in the world. Keep keeping it real. My vote also goes to the darker w/ gray channel bar @ the top. I dig the compromise between dark & light frame. But less is _always_ more. Though I think the lo-band version needs a bit of work to be slightly less visually jarring. As in, smooth out the features a bit.